Rugged electronics are a specific class of electronics designed to work in harsh environments; they can withstand dust, drops, vibrations, and extreme temperatures. Growth in the usage of rugged electronic devices in the defense sector worldwide and their widened application areas are some of the reasons that are expected to drive the global rugged electronics market in the coming years. The additional value they provide in the form of their durability and low downtime is expected to enhance the market’s growth prospects. However, the market is anticipated to be hindered by the low order quantity from individual end users. Moreover, the high cost of rugged electronics in comparison to the benefits of client customization is also expected to be a major restraint to the growth of the global rugged electronics market. The global rugged electronics market is segmented on the basis of product type and end user. On the basis of product type, the global rugged electronics market is segmented into industrial computing and handheld devices, tracking devices, hardware components, and others (security cameras, rugged drones, and rugged sensors). The industrial computing and handheld devices segment is expected to contribute a major share in the global rugged electronics market owing to their increasing adoption in an array of industries such as defense, power, transportation, and adventure sports. This segment is also expected to surface as the fastest growing segment based on product type. Industrial computing and handheld devices is expected to be followed by hardware components segment in the global rugged electronics market. On the basis of end user, the global rugged electronics market is segmented into mining and metal, power, chemical, transportation, healthcare, defense, aerospace, adventure sports and others (agriculture construction, field services forestry, and public safety). Based on end user, the defense segment is expected to hold the major share in the global rugged electronics market owing the growth in adoption of the rugged electronics market by the defense sector, as these devices can handle mission-critical applications in rough battle conditions. The defense segment is also projected to be the fastest growing segment of the rugged electronics market based on end use. This segment is expected to grow at a CAGR of 9.1 % during the period from 2017 to 2025. The defense sector is expected to be followed by the power sector in terms of market share in the rugged electronics market due to the increased application of such devices in power generation and distribution. The global rugged electronics market is expected to be driven by the North America region. North America is estimated to contribute a major share in the overall rugged electronics market with the U.S. providing most of the revenue. The presence of major industry players, along with the adoption of rugged electronics solutions by various industry verticals, is expected to drive the market in the region. The region is also expected to emerge as the fastest growing among all regions. The North America rugged electronics market, valued at close to US$3.5 bn in 2017, is likely to rise to close to US$7.2 bn by 2025 at a robust 9.6% CAGR therein. Europe is expected to follow North America in terms of market share owing to growing awareness and presence of local industry players. Europe is expected to be followed by Asia Pacific in terms of market share. Growth of the Asia Pacific rugged electronics market is accountable to countries such as China, Japan, and India, while South East Asian countries have also contributed substantially to the region’s growth. 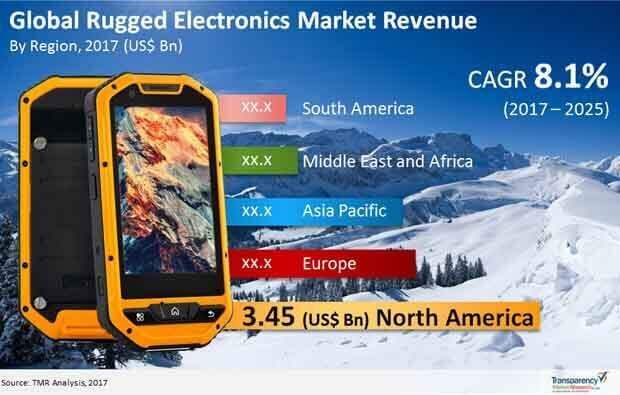 The region is expected to overtake Europe based on market share in the later years of the forecast, with the Asia Pacific rugged electronics market’s 8.5% CAGR projected to lead it to a revenue valuation of US$3.93 bn by 2025. The Europe market for rugged electronics, valued marginally higher than APAC in 2017, is likely to end up at close to US$3.8 bn by 2025, exhibiting a solid 7.2% CAGR therein. Key players in the rugged electronics market include AdLink Technology Inc., Artesyn Embedded Technologies, Chassis Plans LLC, Comark Corporation, Core Systems, Crystal Group Inc., Curtiss Wright Controls Electronic Systems, Inc. , General Dynamics Corporation, General Micro Systems, Germane Systems, Kontron AG, Leonardo DRS, Mountain Secure Systems , NCS Technologies, Inc., Rave Computer , Rugged Science, Schneider Electric SE, Schweitzer Engineering Laboratories (SEL), Siemens AG, Systel, Inc., Themis Computer, Inc., Trenton Systems Inc., Westek Technology Ltd., XES (Extreme Engineering Solutions), Inc., ZMicro, Inc. The market for rugged electronics is anticipated to experience a substantial growth in the near future. This is mainly because rugged electronics are designed to be used in harsh environments and tough conditions, which make them suitable to be used in the military and defense sector. As these electronics are highly reliable, they are the first choice for use in remote areas and in situations where vibrations and extreme temperature disturbances may be present. The global rugged electronics market is mainly divided into several segments based on product type, end user, and geography. Considering the product type criteria, the market for rugged electronics consists of segments such as: rugged tracking devices, rugged hardware components, rugged industrial computing and hand-held devices, and others such as rugged sensors, security cameras, and rugged drones. Based on the end user criteria, the global rugged electronics market is segmented into transportation, healthcare, power, mining and metal, aerospace, adventure sports, TSA, homeland security, defense, and others. All of these are further divided in several sub-segments and are explained in detail in the TMR report. Based on geography, the global rugged electronics market is classified according to Asia Pacific, North America, Middle East and Africa, Europe, and South America. The report presents a detailed overview of the rugged electronics market covering vital factors such as drivers, opportunities, restraints, prime segments, competitive scenario, revenue fluctuations, and many more. The study carried out for this market was possible due to extensive research and analysis of all associated market aspects. Revenue estimates have been presented in US$. A detailed analysis of the market’s growth has been provided in the report for the 2017-2025 forecast period. All the data collected for the rugged electronics market is obtained by conducting primary as well as secondary research. One of the prime growth drivers of the global rugged electronics market is the increasing use of electronic components in military applications. As there is a critical need for reliable communication systems in warfare and combat operations, rugged electronics are able to satisfy this need. Development and innovation in the power industry is another factor responsible for fueling the rugged electronics market. This has further caused a rise in investments from market players, thus leading to better development of the electronics, and subsequently improving the market position. The geographical outlook of the global rugged electronics market has been discussed in great detail in the report. This market is spread across regions such as North America, Asia Pacific, the Middle East and Africa, South America, and Europe. Amongst these, the North American region holds the top spot in the market with respect to the revenue collected and growth. During the forecast period, Europe followed by Asia Pacific regions are expected to hold on the successive positions after North America. Considering factors such as presence of market players across different regions, individual company market shares, and position held by each player, the report describes competitive landscape in great detail. The key market players are listed down on the basis of their market share in the overall market. This section also details various developments carried out by the major companies in recent times. Some of the most prominent companies in the market are: Artesyn Embedded Technologies, Chassis Plans LLC, Core Systems, General Dynamics Corporation, and Trenton Systems Inc., amongst others. From an overall perspective, the global rugged electronics market is likely to offer substantial growth opportunities to key players,, mainly because of expanding applications of these devices.